In part one of smart lighting article series, LEDinside addressed traditional lighting manufacturers’ profit-oriented business strategies as one of the main factors driving the development of smart lighting products. As mentioned in part one of these series, lighting manufacturers will have to turn to smart LEDs as a method to generate sustainable revenue, which ABI Research projected could increase overall LED revenues by 30% in 2020. In this article, LEDinside will explore how budding Internet of Things (IoT) has spurred none traditional lighting manufacturers to enter the smart lighting market, which has led to growing cross-industry collaborations. The number of connected devices in the IoT market is projected to reach 4.9 billion in 2015, and soar nearly five times to 25 billion by 2020, forecasted Gartner. This presents many potential business opportunities both in the commercial, industrial, and residential sectors. For this article we will only be focusing on the residential lighting sector. Tech giants that are not from a traditional lighting background, but have particular interest in smart home applications, and are gradually moving into the smart lighting market include Apple, Google, Microsoft and Xiaomi. 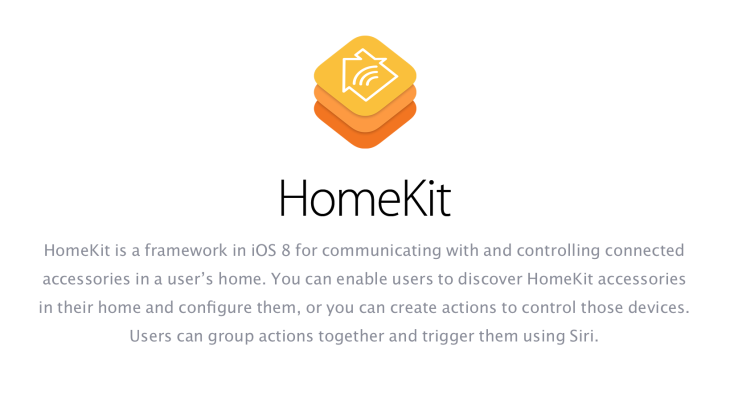 Apple for instance recently announced its Apple HomeKit devices would be available on the market next month. Other none traditional lighting players include smart home service providers Insteon, WeMo, Samsung, LG, semiconductor suppliers Marvell, Silicon Labs, Texas Instruments, NXP, ST Micro-Electronics and even crowd-funded projects such as MiPower. Their entry into the market is projected to drive smart lighting market developments, hopefully resolving different connection protocol issues at some point. The smart lighting sector for residential applications will increase to 223 million by 2020, and achieve a total installed base of over 400 million, projected ABI Research. 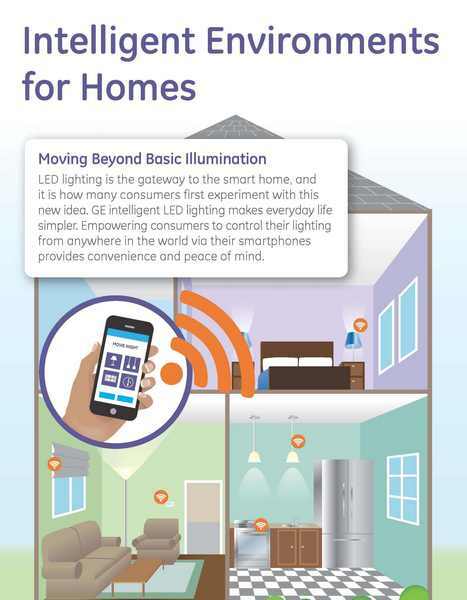 “Because of the additional dimensions smart lighting brings to the consumer lifestyle, including lighting automation, and because of its carbon footprint efficiency, this industry will rapidly become one of the key technologies that could bring IoE closer to consumers,” commented Malik Saadi, Practice Director at ABI Research. This definition illustrates the complexity of integrating devices to a connected network, which requires linking multiple devices together with a single communication platform and system. These presents plenty of technological hurdles in designing a smart lighting product for a single manufacturer. In smart lighting products for home applications, the general design is a color tunable LED bulb paired via Bluetooth, WiFi or Zigbee to an iPhone or Android smartphone. The smartphone replaces the traditional light switch, whereas the lights are controlled by apps specifically coded for the job. Hence, it is not always cost-effective or feasible for a single manufacturer to design a smart lighting system from scratch. A lot of manufacturers are collaborating to develop smart lighting products, or are forming alliances to broaden product applications. The different smart home devices central control camps are headed by different tech giants including Apple Homekit, Google Nest, Xiaomi and Qualcomm's AllSeen Alliance. Samsung joined the smart home competition by acquiring IoT company SmartThings for around US $200 million. In the Apple Home Kit camp are lighting manufacturers Philips, Cree, and Osram Sylvania.Another major player that has signed up with the Apple Home Kit camp to challenge Philips smart lighting market position recently has been GE. 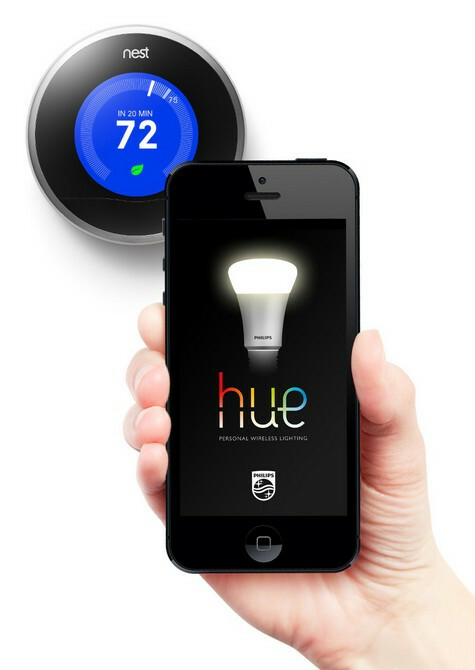 GE announced in early May 2015 that it has launched color tunable smart lights that is compatible with Apple Home Kit. It also announced on the same day it is working alongside with Qualcomm in developing indoor lighting position products. Among major lighting manufacturers, Philips has been most flexible in its smart lighting alliances. When Philips launched the Philips Hue LED bulb in 2012 in U.S., it collaborated with Apple in distribution channels and operating platforms. The bulbs were launched in Apple stores, and at first compatible with the iPhone. The same strategy was once again adopted two years later when the bulbs debuted in the Chinese market. Philips has further deepened its partnership with Apple following the launch of Philips Hue Apps for Apple Watch applications. The Dutch lighting conglemorate later teamed up with Google owned thermostat company Nest in July 2014 and with Xiaomi in February 2015. Meanwhile, other members to join the Nest smart home ecosystem include Insteon and Stack Lighting. By February 2015, Philips signed up with Xiaomi smart home ecosystem. Under this partnership, Philips lighting products will be embedded with Chinese electronic consumer maker Xiamo smart home device components. Xiaomi is working with 17 partners in the smart home market, and lighting partners also include Chinese lighting manufacturers Opple and Yankong Lighting. Another connectivity standard is the AllSeen Alliance’s AllJoyn standard, which is also supported by Microsoft. A couple of large Japanese consumer electronics companies including Panasonic, Sony, Sharp have signed up, but these companies have not launched AllJoyn standard smart lighting products yet. LIFX, a smaller smart lighting company, has so far been the only company actively developing smart lighting products with the AllJoyn standard. The company recently demonstrated how its voice controlled Wi-Fi lighting system could work seamlessly on Microsoft 10 operation system. Other AllSeen Alliance members include home automation product manufacturer Insteon, which also have their own line of smart lighting products. 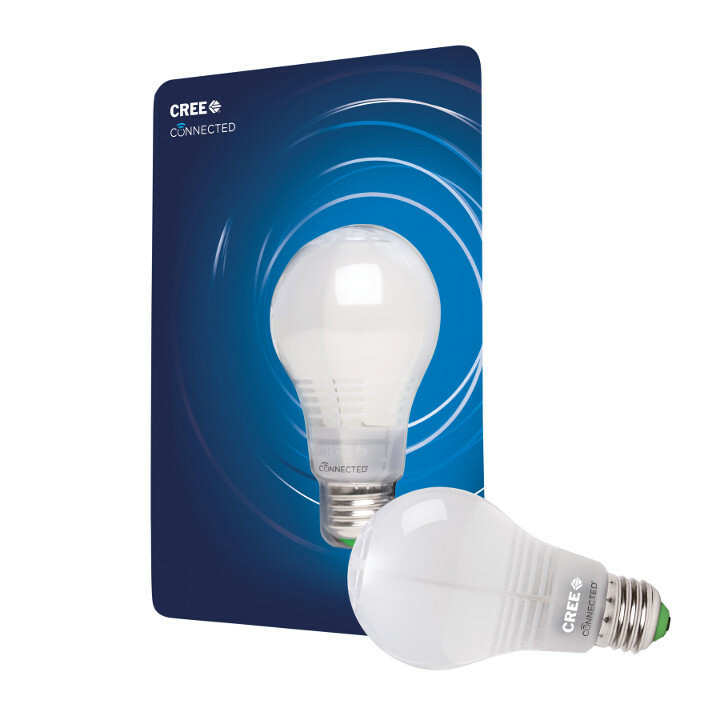 Cree previously made a brave attempt to develop a smart LED bulb that would be compatible on Wink and ZigBee certified hubs, allowing the bulb to function on Philips Hue, WeMo Link Hub and GE Link platforms in January 2015. However, one review by Slash Gear of the Cree Connected LED Bulb noted the light did not work as smoothly as advertised on different lighting control platforms. While Cree’s strength might not be in smart lighting control software, it seems to be turning to IoT service provider WeMo for help for its latest smart LED bulb. Instead of investing resources to develop the smart lighting control system, Cree will only be supplying LED bulbs. This is a similar strategy that TCP Lighting adopted earlier in November 2014. In these partnerships, the LED manufacturer only supplies the LED bulbs which are connected to the WeMo smart home ecosystem via a WeMo hub. The lighting manufacturer is spared the costs and R&D period in the software App and control system, and can just focus on developing LED bulbs. Hence, each company are focusing solely on their technology strengths, the IoT company for instance on connectivity and software technology, while the LED manufacturer is focused on bulb technology. 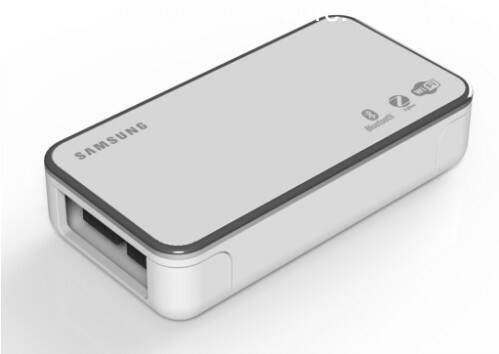 Samsung smart lighting platform for residential, commercial, and building applications. (Photo Courtesy of Samsung). Philips has adopted open smart lighting platforms for their products, therefore allowing third party App developers to customize and come up with their own lighting control system. 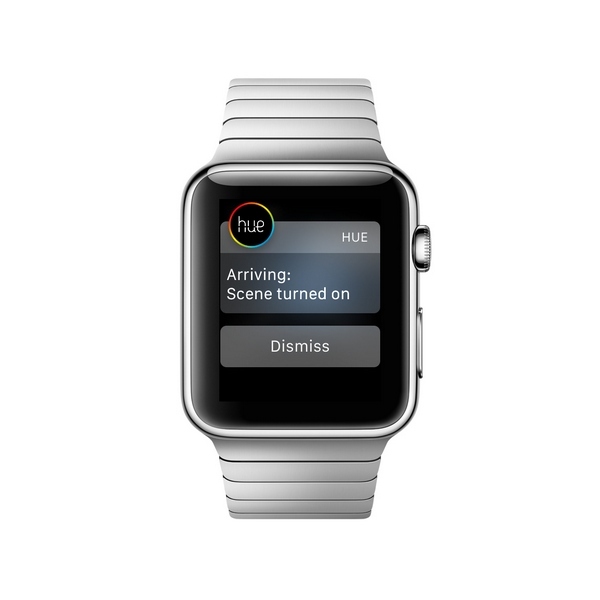 Philips Hue now has over 200 supporting apps, and even can be controlled using Apple Watch. Despite already having plenty of App arsenal, Philips has further expanded its Hue product applications by signing up to IFTTT. WeMo, originally an IoT service provider, has also joined the IFTTT bandwagon to add features to its smart lighting products for home automation applications. In comparison, Samsung is still taking baby steps in its open smart lighting platform, which is not scheduled for mass production till January 2016. Its new smart lighting platform is very ambitious, and expected to cover application sectors ranging from smart residential lighting, building, and city lighting. The plug-and-play LED smart lighting system is supposedly to be compatible with different LED modules and luminaires, while wired connectivity will enable it to work on Zigbee, Bluetooth, and Wi-Fi systems. The biggest challenge remains the lack of standard communication protocols and compatibility between different smart lighting systems. Zigbee is supported by large lighting manufacturers, such as Philips, but Google is promoting 6LoWPAN, and LIFX a smart lighting member of Microsoft’s AllJoyn is relying on Wi-Fi connectivity for its smart lights. Future smart lighting communication protocols will depend on how Google, Apple and other smart home or IOT players plan to develop their smart lighting communication protocols, said Ellis Yan, CEO of TCP Lighting in an earlier interview. Although, the entry of none traditional lighting manufacturers and tech giants in the smart home sector could intensify smart lighting market competition, the influx of more players and formation of various alliances could also speed up smart lighting market maturation. Prices for smart lighting products potentially would be driven down substantially, and become more affordable. At the moment, consumers are not warming up to the products, partly because of its higher prices, and less obvious economic benefits for the average households compared to smart lighitng applications in commercial buildings, retail or streetlights. Moreover, the addition of large tech giants such as Apple, Google, Samsung and Microsoft could spur the adoption of smart lighting products among general consumers either through appealing branding to set a new tech craze, or by offering compatible operation platforms and better connectivity protocols. Smart lighting control app interface designs could also be revolutionized with the entry of large tech giants into the smart lighting market.